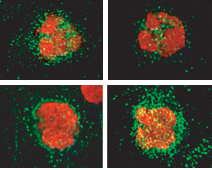 Myeloid cells primarily include monocytes, macrophages, and neutrophils. Our previous work identified a critical role for myeloid cells in the neuroinflammatory response to tissue injury, particularly in the generation and maintenance of mechanical pain. However, the contribution of many skin-resident cells of myeloid origin (including mast cells, dendritic/Langerhans cells, and NK cells) remains unknown. Identifying the contribution of these cells to inflammatory pain will also shed new light on neuro-immune interactions, which underlie the pathology of many diseases and injury states. 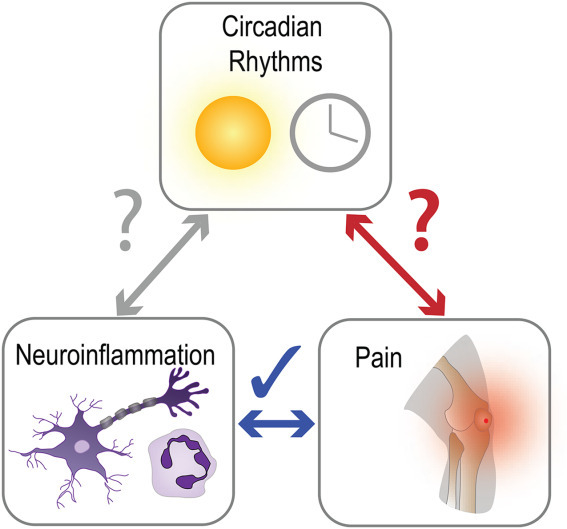 Our group has shown that neuropathic pain follows a circadian pattern in certain patient populations. We are now working to extend these findings to mutliple sclerosis and its mouse model EAE, and other neuropathic conditions. Using circadian rhythms as a tool to modulate disease outcomes, we are now working to identify specific neuroimmune interactions governed by these rhythms and are working to dissect their effects on functional outcomes. Macrophages are the major immune cell contributors to tissue injury and disease. In the injured spinal cord, these cells are derived from two sources: CNS-resident microglia and blood-borne monocytes. These cells respond to injury and disease in the CNS through directed recruitment and activation at sites of damage/injury. Understanding the intrinsic and extrinsic signals that cause their activation, as well as their resulting expression of inflammatory mediators, will lead to new therapeutic options to control their activity. This may help reduce tissue injury, increase remyelination, and improve pain outcomes.